The activities included in this brochure offer visitors a chance to discover the landscape and its heritage in the company of a team of experienced professional environmental and cultural guides. Verd Volcanic is an association of six small independent companies whose principal line of work is the provision of environmental and cultural guiding services in the province of Girona. Our aim is to provide added value, that is, we provide the background and the content that can bring a collection of images (often captured in digital splendour) to life. We share and transmit our passion for our region to those who have the opportunity to visit in the hope that they will take away with them a feel and a respect for the area and its natural and cultural treasures. GUIDED VISITS LA GARROTXA VOLCANIC ZONE NATURAL PARK A visit into the heart – literally! – of La Garrotxa Volcanic Zone Natural Park and its highest volcano, Croscat. A BIRD’S-EYE VIEW OF THE NATURAL PARK A walk up to the medieval castle of Colltort to enjoy a bird’s eye view over La Garrotxa Volcanic Zone Natural Park. THE MEDIEVAL VILLAGE OF SANTA PAU A guided visit to Santa Pau, one of Catalonia’s most treasured medieval villages. THE FLOWERS OF LA GARROTXA A chance to learn about the flowers (over 1,200 species recorded) and vegetation of the protected area of the region of La Garrotxa. L'ALTA GARROTXA A walk from the medieval bridge over the crystalline river Llierca to the village of Oix, nestling amongst the peaks of L’Alta Garrotxa. VIA ANNIA ROMAN ROAD A journey through history along the curves of the magnificent Roman road of the Via Annia. THE REFUGEE'S TRAIL A chance to learn about the exodus from Catalonia at the end of the Spanish Civil War (1939) through a walk down the trail from the French border and a visit to the exile's museum in Camprodon. SANT ANTONI AND CAMPRODON A morning's walk from the historic town of Camprodon up to the church of Sant Antoni, especially designed for naturelovers (vultures, butterflies, orchids ....). BIRDWATCHING IN ELS AIGUAMOLLS L’EMPORDÀ A day’s birdwatching with expert guide in the Aiguamolls l’Empordà, where over 300 species bird have been recorded. ON FOOT FROM CAP DE NORFEU TO ROSES A walk along the coastal footpath from the Cap de Norfeu, a special protection area for its flora and fauna, to the historic town of Roses. CAP DE CREUS LIGHTHOUSE A walk along the coastal footpath from Cadaqués to Cap de Creus, the easternmost point of the Iberian Peninsula. LANDSCAPES, OIL AND WINE IN CAP DE CREUS A circular walk from the village of Pau to the monastery of Sant Pere de Rodes, followed by a visit to the local oil and wine cooperative. MEGALITHIC ITINERARY AROUND ROSES A guided visit to the main dolmens (prehistoric burial chambers) and standing stones around the port of Roses. Mike Lockwood was born in Brighton, but has lived in Catalonia for more years than he cares to remember (almost 30!). 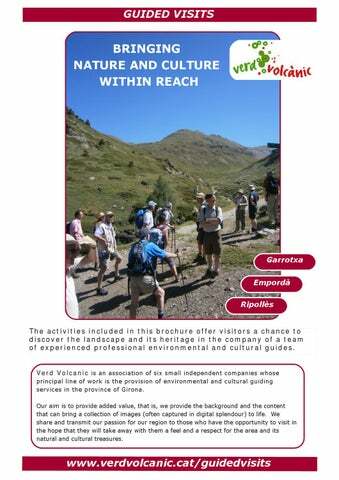 An accredited guide from La Garrotxa Volcanic Zone Natural Park, Mike specializes in wildlife and walking and has published books on local footpaths and insects. Statistician and outward-bound leader, Beth Cobo pulls the strings that bring Verd Volcanic together. Her enthusiasm for everything is ultimately infectious and provides the leadership for many of the new products that Verd Volcanic is currently promoting. Otherwise, Beth is an expert in the region’s volcanoes and volcanic processes. 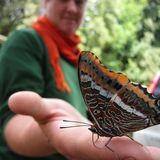 Ester Morchon is, like her colleagues, a fully accredited guide for the La Garrotxa Volcanic Zone Natural Park, where she has been working for well over 10 years. As a trained psychologist, Ester has excellent people-handling and pedagogical skills, which is essential in her other work as an organizer of congresses and events.